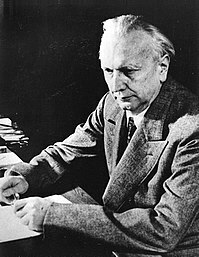 Axial Age (also Axis Age, from German: Achsenzeit) is a term coined by German philosopher Karl Jaspers in the sense of a "pivotal age" characterizing the period of ancient history from about the 8th to the 3rd century BCE. During this period, according to Jaspers' concept, new ways of thinking appeared in Persia, India, China and the Greco-Roman world in religion and philosophy, in a striking parallel development, without any obvious direct cultural contact between all of the participating Eurasian cultures. Jaspers identified key thinkers from this age who had a profound influence on future philosophies and religions, and identified characteristics common to each area from which those thinkers emerged. Jaspers' approach to the culture of the middle of the first millennium BC has been adopted by other scholars and academics, and has become a point of discussion in the history of religion. Jaspers introduced the concept of an Axial Age in his book Vom Ursprung und Ziel der Geschichte (The Origin and Goal of History[page needed]), published in 1949. The simultaneous appearance of thinkers and philosophers in different areas of the world had been remarked by numerous authors since the 18th century, notably by the French Indologist Abraham Hyacinthe Anquetil-Duperron. Jaspers explicitly cited some of these authors, including Victor von Strauß (1859) and Peter Ernst von Lasaulx (1870). Jasper's contribution was to claim that the Axial Age should be viewed as an objective empirical fact of history, independently of religious considerations. He argued that during the Axial Age, "the spiritual foundations of humanity were laid simultaneously and independently in China, India, Persia, Judea, and Greece. And these are the foundations upon which humanity still subsists today". He identified a number of key thinkers as having had a profound influence on future philosophies and religions, and identified characteristics common to each area from which those thinkers emerged. Jaspers held up this age as unique, and one to which the rest of the history of human thought might be compared. Jaspers described the Axial Age as "an interregnum between two ages of great empire, a pause for liberty, a deep breath bringing the most lucid consciousness". It has also been suggested that the Axial Age was a historically liminal period, when old certainties had lost their validity and new ones were still not ready. Jaspers had a particular interest in the similarities in circumstance and thought of its figures. Similarities included an engagement in the quest for human meaning and the rise of a new elite class of religious leaders and thinkers in China, India and the Occident. These spiritual foundations were laid by individual thinkers within a framework of a changing social environment. Jaspers argues that the characteristics appeared under similar political circumstances: China, India, the Middle East and the Occident each comprised multiple small states engaged in internal and external struggles. The three regions all gave birth to, and then institutionalized, a tradition of travelling scholars, who roamed from city to city to exchange ideas. After the Spring and Autumn period and the Warring States period, Taoism and Confucianism emerged in China. In other regions, the scholars were largely from extant religious traditions; in India, from Hinduism, Buddhism, and Jainism; in Persia, from Zoroastrianism; in The Levant, from Judaism; and in Greece, from Sophism and other classical philosophies. Parshvanatha (23rd Tirthankara in the 9th century BCE) and Mahavira (24th Tirthankara in the 6th century BCE), known as the fordmakers of Jainism lived during this age. They propagated the religion of sramanas (previous Tirthankaras) and influenced Indian philosophy by propounding the principles of ahimsa (non-violence), karma, samsara and asceticism. Buddhism, also of the sramana tradition of India, was another of the world's most influential philosophies, founded by Siddhartha Gautama, or the Buddha, who lived during this period; its spread was aided by Ashoka, who lived late in the period. In China, the Hundred Schools of Thought were in contention and Confucianism and Taoism arose during this era, and in this area it remains a profound influence on social and religious life. Zoroastrianism, another of Jaspers' examples, is one of the first monotheistic religions and some believe it greatly influenced modern Abrahamic religions with such conceptions as the devil and Heaven/Hell. The exact date of Zoroaster's life is debated by scholars, with some, such as Mary Boyce, arguing that Zoroastrianism itself is significantly older. Others, such as William W Malandra and RC Zaehner, suggest that he may indeed have been an early contemporary of Cyrus living around 600 BC. However, Boyce and other leading scholars who once supported much earlier dates for Zarathustra/Zoroaster have recently changed their position on the time when he likely lived, so that there is an emerging consensus regarding him as a contemporary or near-contemporary of Cyrus the Great. Shmuel Eisenstadt analyses economic circumstances relating to the coming of the Axial Age in Greece. Therefore, first, it is a mistake to belittle Jaspers' first hypothetical conceptualizations of 1949—because he was a skeptic of his own idea and did not reify it as if it were true or completely stated as fully as he wanted yet, in what he called his "short book". Second, nonetheless, it is a mistake when scholars think they have falsified Jaspers' thesis if they find grounds to doubt his demarcated dates of 800 BCE to 200 BCE, as if that is the only point to debate or to falsify. To believe clear dates is the only issue of importance about the "axial age" is to ignore that Jaspers' own argument had three other levels: it was equally a geographic argument centered on three areas of the world; it was an argument about the historical continuity and flow to the present instead of ending in 200 BCE; and it involved another geographic argument about the ongoing borderland experiences of the axial experience begun there yet expanding until the whole world was encompassed by axial religions by the 20th century. ) After all, ‘axial’ as his chosen term was meant to be ‘pivot,’ since everything in it, like after it, was changed forever instead of misconstruing Jaspers claimed an ‘axial age’ was exclusively bounded by a finished temporal period. Effectually, he argued only for particular demarcated origins of the ‘axial age’ on the one hand, and yet on the other hand, argued there was no upward bound demarcation temporally or spatially on the ‘axial age’ itself since the wider expanding geography of the ‘axial age’ has never ended and in his view is the period in which we are still living. In short, after very locused beginnings of the axial religions, world history has pivoted—never returning to previous forms and slowly expanding around the world, instead of the ‘axial age’ only being one clearly demarcated period now finished and moving to something different after 200 BCE as may be misconstrued. Therefore it is in the spirit of Jaspers himself to welcome a further refining of his hypothesis. Mary Boyce was the first to question some aspects of Jaspers’ formulation, particularly on whether the earliest axial religious movement of Zoroaster was really in Jaspers’ “axial age” of 800 BCE to 200 BCE at all—or a much earlier date or in a different northern border region altogether. In 2006 Diarmaid MacCulloch called the Jaspers thesis "a baggy monster, which tries to bundle up all sorts of diversities over four very different civilisations, only two of which had much contact with each other during the six centuries that (after adjustments) he eventually singled out, between 800 and 200 BCE". Noted above though, MacCulloch misconstrues that the two criteria he chose to falsify could falsify the whole concept of an ‘axial age’. He picked the wrong two to falsify since clearly defined temporal boundaries of its origin are not a crucial point of the ‘axial age’. Jaspers crucial point remains unfalsified by MacCulloch since the ‘axial’ or pivoting quality only began then and still continued ever afterward to the present. Second, for MacCulloch’s other chosen criterion to falsify about intercultural communication, it was not a crucial preliminary causal criterion upon which to falsify Jaspers’ thesis either, because Jasper argued the reverse. First, the axial age set the stage with three similar more autonomous historical sociological contexts that only later could develop greater human intercommunication, empathy, and cross-conversion potentials because of their common past axial experiences. Thus intercultural communication is not a criterion creating the axial age itself though a consequence of the origins of the axial age. Plural, more unrelated, and more autonomous civilized regions of the axial age only could come to find they had certain points in common later after they all had experienced the common characteristics of the axial religions, described in Chapter 1 of the book. In 2009, environmental sociologist Mark D. Whitaker argued from comparative historical case study both about the origins of different axial religious phenomena and the period afterward to the present. ) Whitaker has three main critiques of Jaspers’ framing and analysis. First, Whitaker argued that Jaspers’ discussion that associated stability and singular successes of the axial faiths as deriving within this ‘axial age’ period of origin is to misconstrue and conflate two phenomena—the origins of the axial faiths and the origins of their singular stabilities. (p. 201) These issues had different and distinct origins. To the contrary of Jaspers, Whitaker argues first the axial faiths were hardly stable or singular at their origins. They were whittled to fit and delimited in number after hard-won attempts at it for centuries by novel imperial elites. Instead, the origins of the axial age were characterized by many faiths—unstable, fractious, heterodox, anti-systemic or unconcerned with state power, untractable, and uncooperative—the direct opposite of the later more stable and singular systemic state-sponsored versions which were a neutered and delimited version of axial faiths instead of being part of the origins of the axial faiths per se. This singularity and stability to the axial faiths developed only after many hard-won and unpredictable attempts at whittling the ‘round’ and boisterous communities of the axial faiths to fit the staid ‘square holes’ of state jurisdictional authorities, instead of it being possible to conflate the singularity and stability of the successful religions with the origins of the axial age itself. Instead, much religion in the origins of the axial age died out from lack of later sponsorship, was attempted to be selectively appropriated only, or was attempted to be wholly repressed. The singularity and stability is a project of later empires instead of the origins of the axial age itself. The empires conquering across the axial age selectively appropriated only a few narrow tactics and beliefs of the axial faiths, attempting to ‘repurpose’ their tactics and ideas toward social projects unrelated to them like state support, bureaucratic staffing, hierarchical legitimacy, and subservience. Whitaker argues the true origins and original meaning of the axial faiths were more collectively inert to state elites or were collectively anarchistic, individually libertarian, solely regionally representative, and/or apolitical by expressing themselves in mysticisms of “hermitage, hedonism, and hermeticism” sometimes violently and sometimes with pacifism. (p. 200) In short, Whitaker argues that the axial age’s character is far more anti-systemic and revolutionary. This is contrary to later delimited singular and ‘stable’ forms of religion that were whittled down to serve elite attempts to re-acculturate people to state authority by highly policed and delimited texts or beliefs—that religious followers were allowed to have only to server as better acculturated state bureaucratic elites or followers. He argues encouraging later generations to acculturate to states and hierarchical religious leaderships is to forget truly the revolutionary, hydra-headed, and endlessly heterodox and unmanageable origins of the axial faiths that changed from region to region instead of having any singular shared tenets. Second, Whitaker disagrees as well with Jaspers’ views that the ‘axial’ context created that religious stability to the present either. Instead, both the original and growing axial geographies to the present innately house vast pluralities of different regions ever ready for reappropriation of the axial traditions toward anti-systemic revolt by sometimes collaborating across regions against elites yet in many cases additionally in self-destructive battles among themselves. This is why there is such a history of deep terror in state elites about heterodoxy that began in the origins of the ‘axial age’ and attempted to continue after this nascent period by poking out whenever state elites got lax in policing against it. They saw such axial religions as making their territories ungovernable more than making them governable because motivated followers of axial religions could be “thoroughly uncontrollable”. (p. 408) The history of the reputed stability of the axial faiths is a history of desperate policing against ever-inventive peasant or regional heterodoxy because the axial faiths remain a powderkeg of religiously-inspired secular social movements whenever they start to get used by people to develop their own future agendas as distinct from future agendas of where elites want to go. Third, the anti-humanist wing of environmentalism known as deep ecology has argued (for example, in the writings of David Suzuki) that that the religious movements of the axial context were a bad move away from ‘environmental’ issues. This is denied by Whitaker because to the contrary the axial faiths were themselves ‘ecological revolutionary’ regional movements that merged both ecocentrism and humanocentrism. His evidence is three kinds of environmentally-embedded regional concerns in the origins of the axial faiths as three similar issues seen in different historical cases: “health, ecology, and economy”. The material politics of the axial faiths were fresh health/medicine movements, localization/ecological protection movements (some violent, some peaceful) against elite jurisdictions of external extraction or war, and were economic-technical self-help movements and welfare state movements without a state per se (like in early Christianity in the Roman Empire or in urban movements combining “unconditional love” and high technical savvy around Mozi in China, for examples). If the axial religious origins were an inventive cultural rejection of the earlier first nascent states on grounds of that such states increasingly eroded their “health, ecology, and economy”, then there is little need to ‘go back’ to environmental concern presumably lost in the axial faiths, though simply to remember more correctly the true original meaning of the axial faiths more accurately as combining regional environmental concerns with regional social solidarity. This made them a formidable force particularly against divided and weakening states. However, as implied above, their ongoing hotly contested regional divisions made them easily divided and conquered by stronger disciplined martial states. Such states attempting military consolidation in retrospect regularly chose to align and to sponsor more violent versions of axial faith followers as clients, to encourage and organize them in wider group repression of others. These three points summarize why Whitaker argues the origins of the axial faiths were in hydra-headed multi-regional “ecological revolution” in their original meanings, while any (reputed) singular stabilities of the axial faiths were closer to a highly policed, fragile, and unpredictable endeavor that always threatened to get out of elite management. Whitaker attempts to provide evidence for an open-ended strategic and tactical interaction of the earlier, unrepresentative, nascent areas of state formation contributing to causing the later first ongoing axial-religious mobilizations against it, in those select regions only. This is seen in the first instances in the origins of the axial age and in later instances in the same dynamic throughout world history in any region, past or present once nascent states developed in different other regions worldwide or began to develop opposition in secondary states. In 2013, another comprehensive critique appears in Iain Provan's book Convenient Myths: The Axial Age, Dark Green Religion, and the World That Never Was. ^ a b Metzler, Dieter (2009). "Achsenzeit als Ereignis und Geschichte" [Axial age as happening and history] (PDF). Internet-Beiträge zur Ägyptologie und Sudanarchäologie (IBAES) (in German). 10: 169. Retrieved 17 January 2018. ^ Jaspers, Karl (2003). The Way to Wisdom : An Introduction to Philosophy. New Haven, CT: Yale University Press. p. 98. ISBN 0-300-09735-2. .
^ Jaspers 1953, p. 51 quoted in Armstrong 2006, p. 367. ^ Neville, Robert Cummings (2002). Religion in Late Modernity. SUNY Press. p. 104. ISBN 0-7914-5424-X. ^ a b Eisenstadt, SN (1986). "Introduction". The Origins and Diversity of Axial Age Civilizations. SUNY Press. pp. 1–2. ISBN 0-88706-094-3. ^ Pollard, Elizabeth; Rosenberg, Clifford; Tignor, Robert (2011). Worlds Together Worlds Apart. NewYork: Norton. p. 162. ISBN 978-0-393-91847-2. ^ Fisher, Mary Pat (1997). Living Religions: An Encyclopedia of the World's Faiths. London: IB Tauris. p. 115. ISBN 1-86064-148-2. ^ "Parshvanatha". Encyclopædia Britannica. Online. 2007. Retrieved 2007-10-22. ^ "Mahavira", Britannica Concise Encyclopedia, Encyclopædia Britannica, 2006 . ^ Mahavira, Answers, 28 Nov 2009 . ^ Zydenbos, Robert J (2006). Jainism Today and Its Future. München: Manya Verlag. pp. 11, 56–57, 59. .
^ a b Boyce, Mary (1979). Zoroastrians: Their Religious Beliefs and Practices. London: Routledge. ISBN 0-415-23903-6. ^ Malandra, William (1983). An Introduction to Ancient Iranian Religion. Minneapolis: University of Minnesota Press. ISBN 0-8166-1114-9. ^ Brown, Brian Arthur (2012). Three Testaments: Torah, Gospel, and Quran. Lanham, MD: Rowman & Littlefield. pp. 23–24. ISBN 978-1-4422-1492-7. ^ Voegelin, Eric (2000) . Order and History (Volume V): In Search of Order. Collected Works. 18. Columbia, MO: The University of Missouri Press. ISBN 978-0-8262-1261-0. ^ Christian, David (2004). Maps of Time: An Introduction to Big History. California World History Library. 2. University of California Press. p. 319. ISBN 978-0-520-23500-7. Retrieved 2013-12-29. Not until the first millennium BCE do the first universal religions appear. Though associated in practice with particular dynasties or empires, they proclaimed universal truths and worshiped all-powerful gods. It is no accident that universal religions appeared when both empires and exchange networks reached to the edge of the known universe. Nor is it an accident that one of the earliest religions of this type, Zoroastrianism, appeared in the largest empire of the mid-first millennium BCE, that of the Achaemenids, and at the hub of trade routes that were weaving Afro-Eurasia into a single world system. Indeed, most of the universal religions appeared in the hub region between Mesopotamia and northern India. They included Zoroastrianism and Manichaeism in Persia, Buddhism in India, Confucianism in China, and Judaism, Christianity and Islam in the Mediterranean world. ^ Graeber 2011, p. 224. ^ "Karl Jaspers". Stanford Encyclopedia of Philosophy. 2006. Retrieved 2006-06-14. ^ Szakolczai, Arpad (2003). The Genesis of Modernity (First hardcover ed.). UK: Routledge. pp. 80–81. ISBN 0-415-25305-5. ^ a b Szakolczai, Arpad (2006). "Historical sociology". Encyclopedia of Social Theory. UK: Routledge. p. 251. ISBN 0-415-29046-5. ^ Eisenstadt, Shmuel N. (2012). "Introduction: The Axial Age Breakthrough in Ancient Greece". In Eisenstadt, Shmuel N. The Origins and Diversity of Axial Age Civilizations. SUNY series in Near Eastern Studies. SUNY Press. p. 31. ISBN 9781438401942. Retrieved 2015-06-28. The emergence of this specific type of Axial Age breakthrough was connected with the special mode of disintegration of the tribal communities and of construction of new collectivities and institutional complexes. [...] In the economic field, we find a growing occupational differentiation between the economic ties to the land and the urban vocations, be they in trade, craft, industry, or the ritual and educational fields. This phenomenon was also very closely connected with the development of many free economic resources - partially even land and manpower resources - not bound to ascriptive social units, the concomitant development of widespread internal and external, relatively free, market activities, and the accumulation of relatively mobile capital. ^ Armstrong, Karen (2006). The Great Transformation: The Beginning of our Religious Traditions (First ed.). New York: Knopf. ISBN 0-676-97465-1. ^ Strath, Bo (2005). "Axial Transformations". Archived from the original on September 27, 2007. Retrieved 2006-06-14. ^ Lambert, Yves (1999). "Religion in Modernity as a New Axial Age: Secularization or New Religious Forms?". Sociology of Religion. 60: 303. doi:10.2307/3711939. ^ MacCulloch, Diarmaid (17 March 2006). "The axis of goodness". The Guardian. ^ Mark D. Whitaker, "Our Common Civilizational Problem with Environmental Degradation: A Short Look at the Evidence and Perhaps What To Do About It.". In Global Forum on Civilization & Peace, Paper Presentations at the Fifth International Conference. Conference Proceedings of May 27–29, 2008. Seoul, Korea: The Academy of Korean Studies. (English and Korean translations, two volumes). ^ Stephen K. Sanderson, ‘’ Religious Evolution and the Axial Age: From Shamans to Priests to Prophets (Scientific Studies of Religion: Inquiry and Explanation), Bloomsbury Academic, 2018. Jaspers, Karl (1953), The Origin and Goal of History, Bullock, Michael (Tr.) (1st English ed. ), London: Routledge & Keegan Paul, LCCN 53001441 . Originally published as Jaspers, Karl (1949), Vom Ursprung und Ziel der Geschichte [The origin and goal of History] (in German) (1st ed. ), München: Piper, LCCN 49057321 . Provan, Iain (2013), Convenient Myths: The Axial Age, Dark Green Religion, and the World That Never Was, Waco: Baylor University Press, ISBN 978-1602589964 . Mark D. Whitaker (2009). Ecological Revolution: The Political Origins of Environmental Degradation and the Environmental Origins of Axial Religions; China, Japan, Europe Lambert. Dr. Whitaker's research received a grant award from the U.S. National Science Foundation in Association with the American Sociological Association. Abstract of Mark D. Whitaker (2009). Ecological Revolution: The Political Origins of Environmental Degradation and the Environmental Origins of Axial Religions; China, Japan, Europe. Lambert.